What's For Lunch Honey? : Gâteau Saint-Honoré - The Daring Bakers Strike Again! Gâteau Saint-Honoré - The Daring Bakers Strike Again! Here we are again the unbeatable Daring Bakers with the challenge for May. As soon as April's challenge was completed we all were eagerly checking the Daring Bakers blog to see what our next challenge and also who the newest members would be. Well after what seemed like an excruciating lapse of time, we were presented with our newest members, the Zeta Class including the first male member, and the challenge. Helene was the host this month, which meant she was the person who would decide on what creativity (or monstrosity) would be coming out of our kitchens. Together with Anita she finally presented us with our challenge for May. 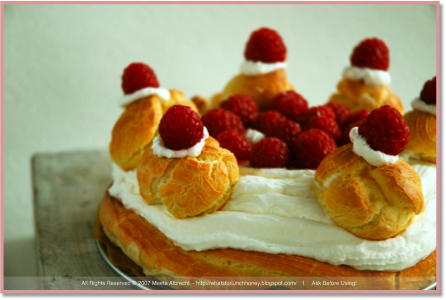 is a traditional French cake named after Saint Honoré, the patron saint of pastry bakers. 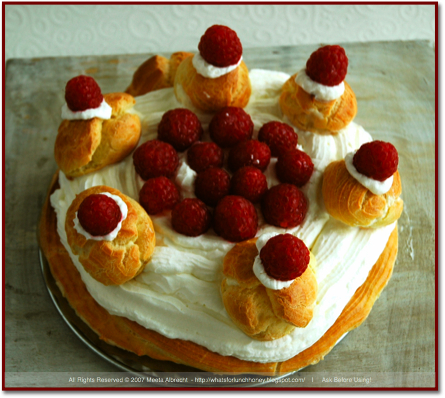 May 16th actually is Saint-Honoré Day, which honors the patron. When I was is Paris for 3 months, learning French as an exchange student, I remember always making a huge detour around this cake. The lovely French patisseries and bakeries would have this gâteau arranged beautifully behind the glass counters. It looked so impressive. It also looked like a million calories per bite. After reading Helene's instructions of how the cake was put together I was scared. I mean really scared. Puff pastry, choux pastry, pastry cream the list of elements making up the cake just did not seem to stop. I read and re-read the instructions. I even went to the library to find other books and pictures for the cake. I asked Helene 101 questions and she was there for each of them. Her wonderful, gentle and soothing way of explaining things slowly but surely took away my jitters. So much so that I actually started to look forward to making this. I was even convinced of making my own puff pastry. I'd like to dedicate this post to my lovely grandmother, who passed away on Wednesday, in Houston. She was as multi-faceted as this cake and just as sweet. A strong willed woman whom I adored. The void you leave behind is immense and the pain that you never got to meet your great grandson in person is endless. I am sorry! No type of dough is more elegant than the puff pastry and nothing in the kitchen gave me more jitters than making this flaky, buttery and light dough. It is sumptuous, sensuous and time-consuming. The hundreds of layers, folding blocks of butter, rolling, folding and doing it over and over so that layer upon layer the pastry will rise - or puff - dramatically when baked. The idea is to distribute the butter evenly in sheets throughout the dough. When the pastry bakes, the moisture in the butter creates steam, causing the dough to puff and separate into many layers. Making this delicate, flaky pastry took me about half a day to make, but the result - hundreds of puffed, crisp, and buttery layers - was, for me, the ultimate achievement. In a large mixing bowl, combine both flours with the salt. Scatter butter pieces over the flour mixture; using your fingers or a pastry cutter, incorporate butter until mixture resembles coarse meal. Form a well in center of mixture, and pour the water into well. Using your hands, gradually draw flour mixture over the water, covering and gathering until mixture is well blended and begins to come together. Gently knead mixture in the bowl just until it comes together to form a dough, about 15 seconds. Pat dough into a rough ball, and turn out onto a piece of plastic wrap. Wrap tightly, and place in refrigerator to chill 1 hour. Sprinkle 1/2 tablespoon flour on a sheet of waxed or parchment paper. Place uncut sticks of butter on top, and sprinkle with remaining 1/2 tablespoon flour. Top with another sheet of paper; using a rolling pin, pound butter to soften and flatten to about 1/2 inch. Remove top sheet of paper, and fold butter package in half onto itself. Replace top sheet of paper, and pound again until butter is about an inch thick. Repeat process two or three times, or until butter becomes quite pliable. Using your hands, shape butter package into a 6-inch square. Wrap well in plastic wrap, and place in refrigerator until it is chilled but not hardened, no more than 10 minutes. Remove dough package from refrigerator, and place on a lightly floured work surface. Using a rolling pin, gently roll dough into a 9-inch round. Remove butter package from refrigerator, and place it in the center of the dough round. Using a paring knife or bench scraper, lightly score the dough to outline the butter square; remove butter, and set it aside. Starting from each side of the center square, gently roll out dough with the rolling pin, forming four flaps, each 4 to 5 inches long; do not touch the raised square in the center of the dough. Replace butter package on the center square. Fold flaps of dough over the butter package so that it is completely enclosed. Press with your hands to seal. Using the rolling pin, press down on the dough at regular intervals, repeating and covering the entire surface area, until it is about 1 inch thick. Gently roll out the dough into a large rectangle, about 9 by 20 inches, with one of the short sides closest to you. Be careful not to press too hard around the edges, and keep the corners even as you roll out the dough by squaring them with the side of the rolling pin or your hands. Brush off any excess flour. Starting at the near end, fold the rectangle in thirds as you would a business letter; this completes the first single turn.Wrap in plastic wrap; place in refrigerator 45 to 60 minutes. Remove dough from refrigerator, and repeat the process above, giving it five more single turns. Always start with the flap opening on the right as if it were a book. Mark the dough with your knuckle each time you complete a turn to help you keep track. Chill 1 hour between each turn. After the sixth and final turn, wrap dough in plastic wrap; refrigerate at least 4 hours or overnight before using. When it comes to pastry doughs, pâte à choux is in a class of its own. Where other doughs can be formed into various shapes, pâte à choux is so soft that it hardly supports itself before baking. Before baking, the choux pastry must either be spooned or piped into shape. Furthermore, pâte à choux contains eggs, in addition to flour and fat, which give the dough the ability to rise dramatically when baked. "Cream puff dough is pastry's Little Engine That Could. Put a spoonful of it in the oven and, as it's expanding, you can just about hear it chanting, "I think I can, I think I can."" This wonderful dough makes the decadent profiteroles and luxurious éclairs. Both belong to my list of favorite pastries. Here it makes the base and the puffs for the Gateau Saint Honore. Sift the flour and set aside. Bring the water, butter and salt to a full rolling boil, so that the fat is not just floating on the top but is dispersed throughout the liquid. Stir the flour into the liquid with a heavy wooden spoon, adding it as fast as it can be absorbed. Avoid adding it all at once or it will form clumps. Cook, stirring like mad and breaking up the lumps if necessary, by pressing them against the side of the pan with the back of the spoon. The dough will come together very quickly. The bottom of the pan will be covered in a white film and form a slight crust, but you still need to stir vigorously for another 2 to 3 minutes. Once it comes together and has slightly dried the dough will be very smooth. Transfer the dough to a mixer bowl. Allow the dough to cool slightly so that the eggs will not cook when they are added. You can add and stir the eggs by hand but it requires some serious elbow grease. Mix in the eggs, one at a time, using the paddle attachment of a mixer on low or medium speed. Add the eggs one by one, beating until each egg is thoroughly incorporated. When you add your first egg the smooth dough will separate - don't worry about that - it's supposed to and as you keep adding the eggs and beating it will re-form into a smooth paste. At the end the dough should be thick, shiny and have the consistency of thick mayonnaise. This is a typical pastry cream used to fill various pastries, however the most famous one is certainly the Saint Honoré Cake. Lightened with egg whites or whipped cream this pastry cream was created by Chef Chiboust in Paris around 1846 to fill his specially created Saint Honoré Cake. The pastry cream can be flavored with lemon or orange zest, liqueurs or vanilla flavoring. Soak the gelatin in the 60ml of cold water. Combine sugar, flour, and salt into a saucepan and whisk until the ingredients are incorporated. Add the yolks and enough milk to make a paste. Whisk in the remainder of the milk and beat until the mixture is pale yellow. Over medium heat cook the mixture, stirring constantly, until the sauce thickens. Simmer for a few seconds, and remove from heat. Add the vanilla and the gelatin, stir until the gelatin is completely dissolved. Stir in the whipping cream, then place the mixing bowl in cold water and stir until the cream has cooled. In a clean bowl pour in the egg whites and using clean beaters, whip them with the dash of salt. As soon as the whites begin to stiffen, gradually add the 100g of sugar and beat until stiff and glossy. Fold the egg whites into the cooled cream. Once the above three components for the Saint Honoré Cake have been prepared, the cake is ready to assemble. There are many small variations to doing this. For example you can caramelize sugar and dip the bottoms and tops of the puffs in the sugar and then hook them onto the cake. I chose not to meddle around with hot caramel this time round and decided to use whipping cream. While I was researching this cake I also saw that some recipes did not fill the cream puffs with the Crème Chiboust, while others did. Here the puffs are filled and I recommend doing this over to leaving it unfilled, because it simply adds to the incredible decadence. I also used a few raspberries I had in the refrigerator to decorate the cake. This final touch was not only a visual feast, but also it added a wonderful fruity and tart flavor to the cake. Pre-heat oven to 200 degrees Celsius. Roll the puff pastry out to 3 mm thick, 30 cm square. Place on a sheet pan lined with parchment paper and refrigerate covered for at least 20 minutes. Fill the Pâte à Choux into a piping bag with a #4 (8mm) plain tip. Set aside. Take the puff pastry out of the fridge and leaving it on the sheet pan, cut a circle (approx. 28 cm) from the dough and remove the scraps. I used the base of my smaller spring form, which is 18 cm, and made two bases by simply pressing down onto the puff pastry. Prick the circles lightly with a fork. Taking the piping bag filled with the Pâte à Choux, pipe concentric rings on the puff pastry base. Depending on the size you used (either 28 cm or 18 cm) you can pipe 3 to 4 circles. 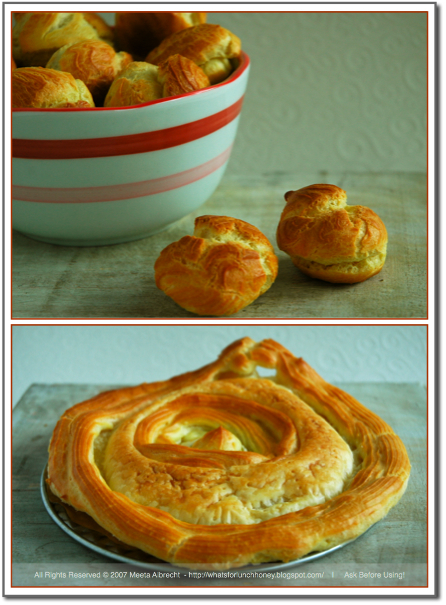 Bake the puff pastry base for 10 minutes until the choux pastry has puffed up. Then reduce the heat to 180 degrees Celsius and bake for a further 35 minutes. In the meantime line a separate baking tray with parchment paper. With the remaining Choux pastry, pipe out individual cream puffs the size of Bing cherries (mine were larger) onto the baking tray. Once the base is ready take it out of the oven and increase the heat of the oven back to 200C. Place the baking try with the cream puffs and bake for 10 minutes, then once again reduce the heat to 180C and bake for another 8 to to minutes, until golden and puffed. Place approx. 115g of Saint Honoré cream in a pastry bag with a #2 (4mm) plain tip. Use the pastry bag tip or the tip of a paring knife to make a small hole in the bottom of each cream puff. Pipe the cream into the cream puffs to fill them and then refrigerate. Pipe the remaining cream filling on the cake. Refrigerate for at least 2 hours to set the cream. Whip the 250ml of heavy cream and teaspoon of sugar to stiff peaks. Place the whipped cream in pastry bag fitted with a #5 (10mm) star tip. Pipe a border of whipped cream around the top of the cake. Arrange the cream puffs, evenly spaced, on top of the filling, next to the cream. Pipe the rest of the cream in the middle of the cake and a small smudge of cream on top of each cream puff. Decorate with raspberries. This was served as a finale to a French dinner I had for a few friends. As the kids were also present I did not use any alcohol in the cream. While I was making the cake I naturally tasted everything individually. I was finding everything rather sweet for my likings and that really is saying something. I have the sweetest tooth ever. That is why I decided to add the raspberries to cut the sweetness a bit. However, in the evening when I cut a slice for each of my guests and we all sat down to enjoy this cake, I realized it was not as sweet as I thought it would have been. 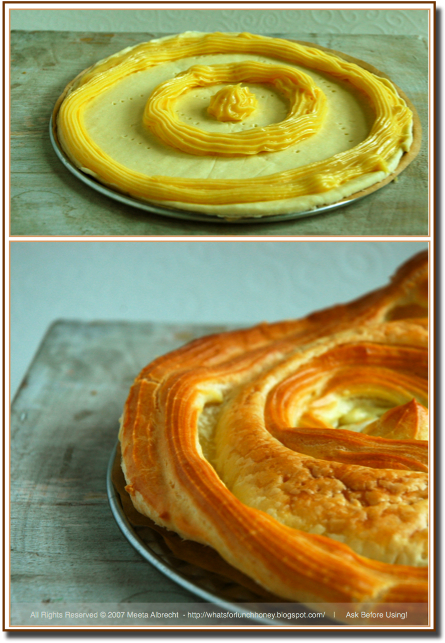 The puff pastry and choux pastry took away a major part of the sweetness from the pastry cream and whipping cream. I found that the raspberries were an incredible improvement to the entire cake. The tartness of the berries was so perfect combined with the rest of the elements. The cake itself only gets it's flavor from the pastry cream. The other components, puffy pastry and choux pastry are more or less neutral, so the flavoring used in the cream has to really stand out. Would I make this again? I think I would but not in this form. I have my eye on a delicious chocolate version from Pierre Hermé's Chocolate Desserts. What did I learn from this challenge? Making choux pastry is something that I think I will cherish the most from this challenge. I love eclairs and profiteroles and with this I can make them at home now. So, this challenge was great as a whole, but for me, learning to make the individual components were the most valuable. Helen, I thank you from the bottom of my heart - not only for choosing this cake as our challenge but for going out of your way to motivate me, advice me and inspire me each step of the way. 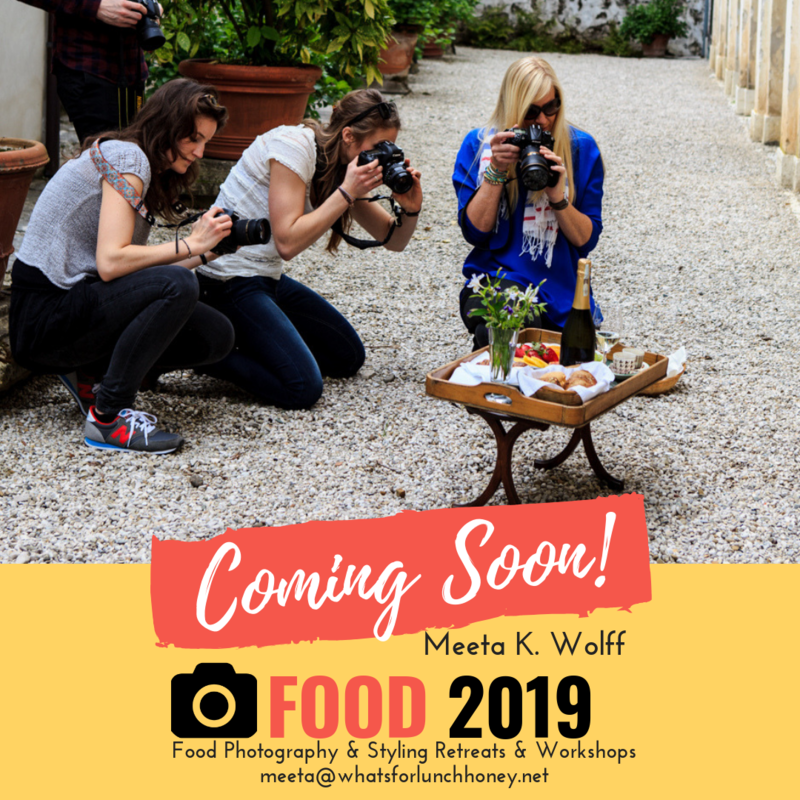 I had my own personal instructor by my side and your valuable lessons will be used in the future to showcase a few great recipes, which I am already looking forward to. So, that was May's challenge with the incredible Daring Bakers. Visit each member on the Daring Baker blog roll to see their amazing creations. I am now looking forward to the June challenge and to our new June DB members. I know we are going to be joined by our second male member Jef, whose blog I am really enjoying for a while now. To all the June members I'd like to say my official hello and welcome to the team. For future reference I have added the three main elements - puff pastry, choux pastry and the chiboust cream, to the sidebar section "The Know-Hows of Food" under the drop down menu "How Tos". So, if you do not fancy making the entire cake but would like to make one of the elements found in this cake for another dessert, all you need to do is click on the sidebar drop down menu and select the desired item. You will be forwarded to that exact item in this post. If you like my work, stories and recipes, please take a moment to vote for me in the category you see fit. Vote here. Thanks for your support! Wow! I love the raspberries as decoration on the cake and I think they would be a wonderful, tart foil to the rich cream. So sorry to hear about your grandmother, this gateau is a lovely memorial to her. I'm sorry to hear about the passing away of your grand mother, my condolences to you and your family. The cake just looks great! Superb Meeta I think someone used my idea and nipped off to Paris to get a cake! I'll add in my condolences too. such a lovely well detailed post :) Your cake looks really good. Your photo's are awesome! Hi Meeta! Your cake is just gorgeous - I love the use of the raspberries on top! Way to overcome your fear of the challenge and succeed! I'm so sorry to hear about your grandmother... my deepest condolences to you and your family. You know how sad I am for you about the passing of your grandmother. Your email made me cry and touched a personal cord. 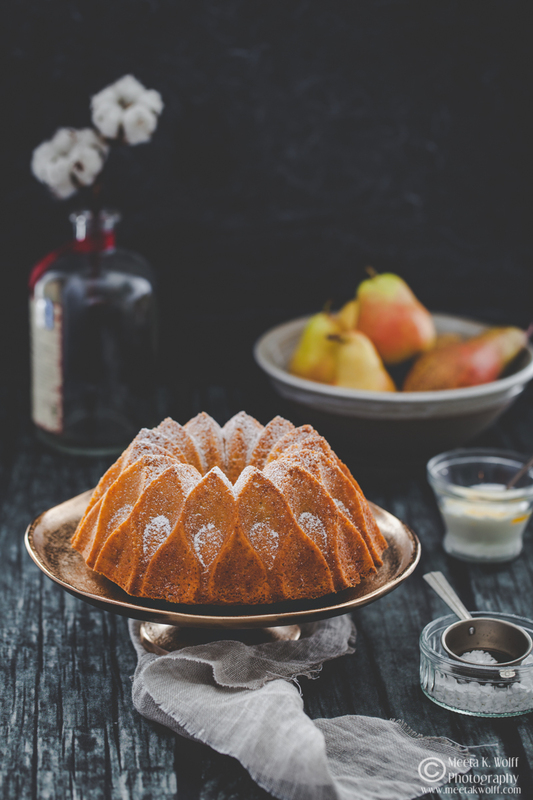 I am sure that your grandmother would love this cake, complex yet sweet and comforting. Beautiful job, and bravo for daring it again! aww, you didn't want to do the caramel? It's the coup de grace of the entire pastry. As if you weren't already scared enough by the puff, the choux, and the chiboust. picture with the raspberries too. I'm sorry to hear about your Grandmother to (()). Just never easy to lose the ones we love. Really wonderful and gracious how you show what was learned in this process. That's the wonder and beauty of this group. Not scared any more, right! Very pretty-love the raspberries on top! 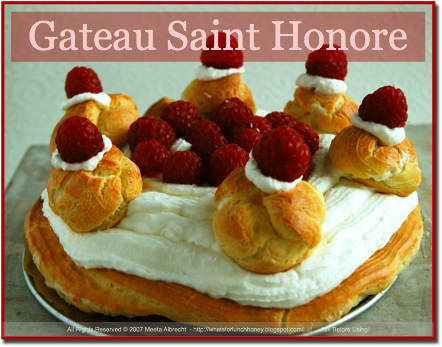 As always we can totally rely on you for as much information about gateau St. Honore as is out there. So informative! I love your gateau. It looks so clean and the raspberries are the perfect drop of colour (I used them on mine as well ... great minds think alike!). I echo everyone's condolences, Meeta. Yours looks like a proper cake, quite regal even. Well done! So sorry to hear about your grandmother, this is a lovely tribute to her. Your words to describe her touched me. Doris' description is just great! I agree with you on the sweetness of this cake, I wasn't too sure about it as my tooth is totally not sweet at all, but this cake...love it! Holy cow, when you write a post, you write a post. This will be very helpful to many people. Great job. What a great, comprehensive post. Your grandmother would be proud of your skills and that gorgeous cake. Your cake looks like a party with the raspberries - so festive! It is beautiful! Meeta, wow! It looks brilliant. Great post as always. It's nice that you dedicated this to your grandmother. My deepest sympathies to you and your family. The raspberries look so luscious on top of your wonderful cake! Sorry to hear of the passing of your grandmother. Your family is my thoughts and prayers. Lovely presentation! Kudos! Your grandmother would be very proud. Wow~you daring bakers are something else-your dessert looks wonderful, Too! Your gateau looks awesome, Meeta. =) I like the idea of the added tartness that raspberries would lend. Good idea! I'm very sorry to hear about your Grandmother. You've been in my thoughts as well..
What a great write up. I really like the attention you give to each part and love the addition of the berries. We love you and your gateau Meeta! Awesome job! Your cake looks terrific. I'm sorry to read about your grandmother. May she rest in peace. So pretty with the little raspberries - it looks like a cake castle! Your posts are always so thorough, I wish I had read this before attempting mine! I thank you all for your very kind words. It means a lot to me. I really appreciate it. This cake was a fantastic challenge and was so energized by the buzz at the DB blog . Now bring on the June challenge LOL! Wow Meeta,a very daring dessert indeed!I saw this recipe in one of the books that I got from the library but all that work gave me jitters but I think I am going to try it out once now. Sorry that your Grandmother passed away..atleast you know she will be watching over you and her great grandson too. I'm sorry to hear about your grandmother! I'm sure she is giving her approval on your gateaux though, and honored to have such a lovely creation dedicated to her. Meeta, I'm so sorry for your loss, sweetie. And what an adorable thing to dedicate it to your grandmother - your gateau is divine! Condolences on your grandmother Meeta. Your gateau is wonderful tribute to her - it's so pretty and sweet looking! I have been unable to read the rest of your post. So I will only comment on this gorgeous looking photo. I read on the comments that your grandmother has passed away. I'm sorry to hear that. What an impressive post. I am in awe! So thorough, so professional. Truly excellent. Your grandmother would be so proud to know you've honored her in this fashion. And the gateau -- lovely! My deepest condolences on the loss of your grandmother. Beautiful gateau. 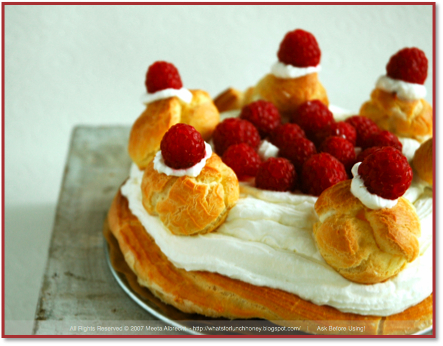 I love the contrast of colors between the pastry, the cream and the red of the raspberries. Beautiful Meeta! I am sorry to hear about your grandmother and I am sure she would be honored. I always look forward to the grand reveal of you Daring Bakers. Y'all are something else. My sincere condolences on the passing of your grandmother. You all are really wonderful and all your thoughts and prayers are treasured and very appreciated. Hugs back to all of you! What a wonderful challenge this was for all of you Daring Bakers. Your Gateau Saint-Honore is quite an achievement. 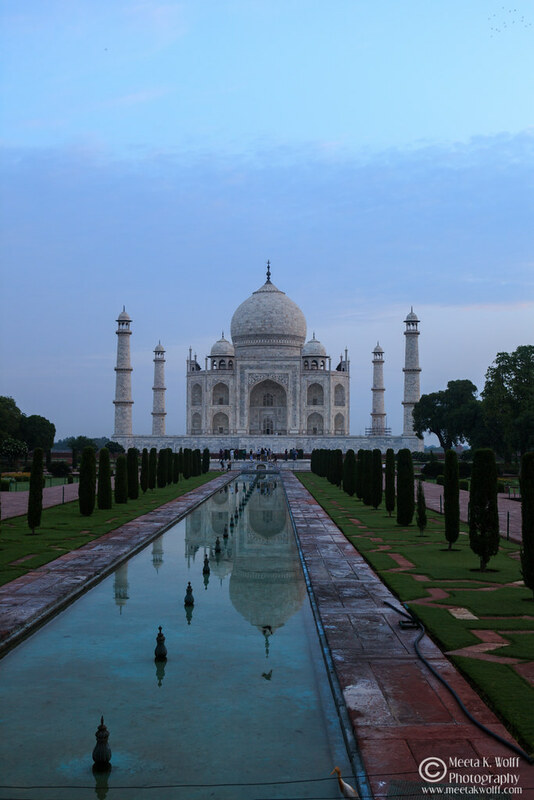 You never cease to amaze me with your gorgeous photos and your informational posts! Nicely done. That was an amazing post! You described everything so beautifully, and the gateau looks delicious. How proud your Grandmother would be, to see how creative you are! What a beautiful, creative and classic way to honor your grandmother! I loved reading your reflections on the experience. My thoughts are also with you and your family during what I know must be a difficult time. I am so sorry to hear about your grandmother, Meeta. My heartfelt condolences to you and your family. I'm so sorry to hear about your grandmother, but your daring creation is a beautiful way to honor her memory. Thanks once again for your feedback and motivating comments. They always mean a lot!! Salute you dear girl for trying and succeeding in this challenge!! I would never ever dare to do something like that - no wonder im not a part of daring bakers LOL!! You are a gutsy lot! I just found your blog and so far was impressed with every recipe, photos and presentations. This recipe is fantastic, as well as story! Thank you for visiting What's For Lunch, Honey? and taking time to browse through my recipes, listen to my ramblings and enjoy my photographs. I appreciate all your comments, feedback and input. I will answer your questions to my best knowledge and respond to your comments as soon as possible. In the meantime I hope you enjoy your stay here and that I was able to make this an experience for your senses. Get all our post right into your inbox! >> Experience a past Workshop!! 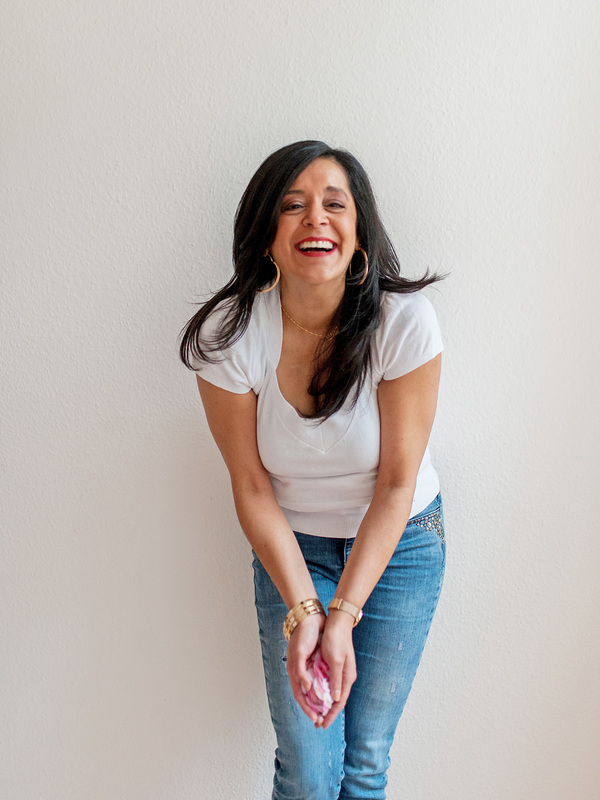 >>Sign up for my workshop newsletter and get priority registration to all workshops! 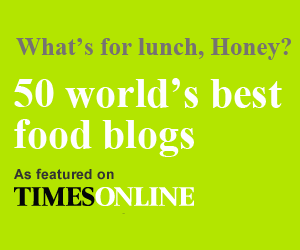 All photographs and written content on What's For Lunch, Honey? © 2006-2019 Meeta Khurana Wolff unless otherwise indicated. All rights reserved. If you are interested in using my texts or photographs please contact me. You may not use my work for commercial purposes without my permission.